An Interview with Nadia Gathers - POCIT. Telling the stories and thoughts of people of color in tech. Everyone loves hearing origin stories. How did you first get into tech? My father works in technology at a state university. I used to sit in his lap like a baby and play a typing game he’d pull up on his screen. As I got older, he never stopped encouraging my inner tinkerer, and so I was constantly building things and taking apart computers. Weirdly, I didn’t consider a career in tech. I was into everything: writing, chemistry, physics, art; you name it. Your background is originally in Social Entrepreneurship. Can you tell us more about that and how you came to work at Code2040? I originally wanted to be a finance major, but that didn’t last long. I made my way through everything from chemical engineering to creative writing. I realized that at the core of all my interests was empowering people, and social entrepreneurship did that in a creative way. We didn’t have a Socent major [interviewer note: Socent is short for Social Entrepreneurship], so I ended up designing the curriculum. I ended up as a University Innovation Fellow at the d.school because of it, and from there I explored careers post-grad out west. Code2040 was the happy intersection of a lot of things I cared about. For folks who haven’t heard of Code2040, what does the org do? 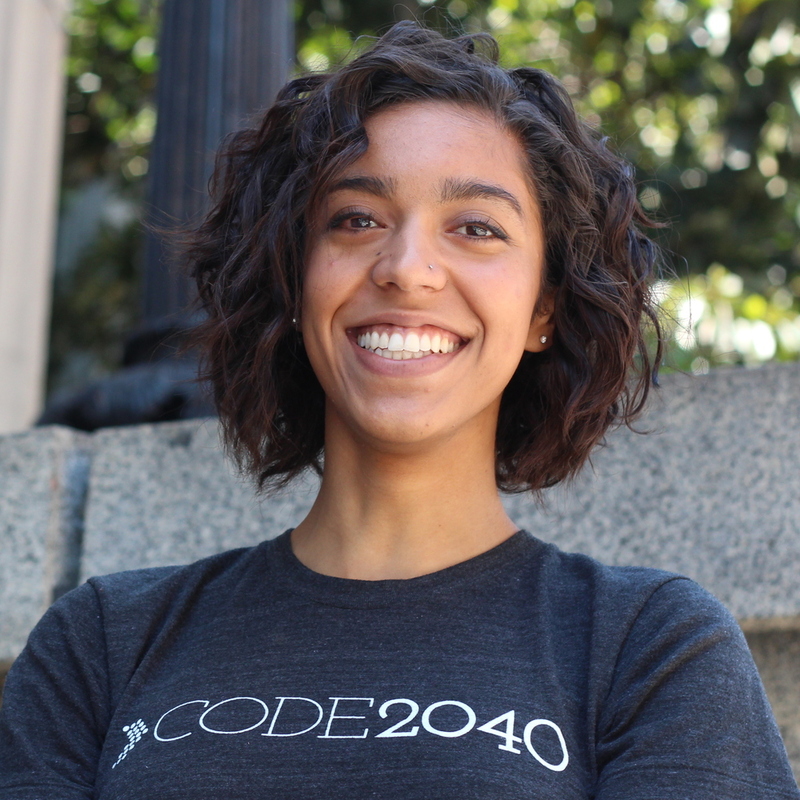 Code2040 is a nonprofit working towards racial equity in technology. We started with our flagship Fellows program, bringing top performing Black and Latinx college students to the Bay Area for summer-long internships at tech companies. We now operate four main programs, including ones focused on company culture change, empowering minority entrepreneurs, and preventing computer science student dropout. I looked at the team page, and Code2040 is awesomely living its mission, with the majority of staff being POC. How (if at all) is that different than other environments you’ve been in? For one, I never have to worry about bringing my full self to work. When things are tough, I know that I’m in a room of people who understand me. When I first came to Code2040, I was open and honest about my history with mental illness. It’s been amazing to see the support that’s come from my teammates, and space it’s made for others to tell their stories. You’ve written about feeling the pressure to push yourself because you work in social change. Where does that pressure come from and how much of that is tied with being from a marginalized community? I was a super anxious child. I wouldn’t have classified myself as that until recently. In high school and college, I was waist deep in an eating disorder, so a big part of that push comes from this internal stress to control. In both of my cultures, mental illness just isn’t something we talk about. Depression is a weakness. It’s taken work to get people to understand, but I feel supported now. I think the pressure also comes with the idea that I am the product of generations of hustle, and I have a responsibility to make those people proud. Sometimes that’s good pressure; sometimes it’s not. How do you think we can enable people to do this kind of important work in the long term without burning out? Right now, tech culture is all about hustle. It doesn’t leave room for humans just being. It doesn’t leave room for healthy relationships and healthy minds. It barely leaves room for fulfillment. It’s important for us to have open conversations with each other about burnout and mental illness, especially for marginalized peoples. Even more importantly, it’s important for leaders to take those steps. I can talk about my depression all I want, but if my executive team doesn’t respect it, I’m vulnerable. If you are feeling burnt out – you’re not broken. You’re not alone. I write/edit at medium.com/@Code2040. I’m also giving a keynote at Affect this year- hang with me! Founder of Affect Conf, co-organizer of Resolution Fest, and product designer. She’s designed for Upworthy and written pieces for Model View Culture and The Pastry Box.